One of President Theodore Roosevelt’s lasting contributions as our 26th president was the preservation of some of our country’s most unique natural and cultural resources. His speech in Memphis in 1907 to the Deep Waterways Convention is hailed as a milestone in the beginning of the conservation movement. 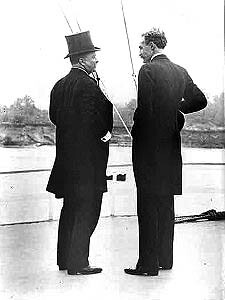 Arriving Oct. 4 on the USS Mississippi, Roosevelt landed at our Cobblestone Landing accompanied by Gifford Pinchot and WJ McGee, all of whom saw the importance of the Mississippi Valley and a network of waterways linking the U.S.
His speech in Memphis was the first address by a federal official and U. S. President on the need for a balance between commerce and conservation. The issue, then and now, is the stewardship of our land, water, and cultural heritage. It is the bedrock on which the National Park Service was founded. Today the Cobblestone Landing, which has been in continuous use for more than 150 years, is the best preserved of all the great commercial boat landings on the MS River and is listed on the National Register of Historic Places. It’s proper restoration and maintenance as a fully functioning boat landing for the future is important. Thank you to the website, Equal Gravity and its post, "Memphis: Birthplace of the Conservation Movement", for bringing this important historical conservation fact to our attention.